The Master replied, "What is necessary is to rectify names." "So! indeed!" said Tsze-lu. "You are wide of the mark! Why must there be such rectification?" "If names be not correct, language is not in accordance with the truth of things. If language be not in accordance with the truth of things, affairs cannot be carried on to success. "When affairs cannot be carried on to success, proprieties and music do not flourish. When proprieties and music do not flourish, punishments will not be properly awarded. When punishments are not properly awarded, the people do not know how to move hand or foot. "Therefore a superior man considers it necessary that the names he uses may be spoken appropriately, and also that what he speaks may be carried out appropriately. What the superior man requires is just that in his words there may be nothing incorrect." 'Confucius' (September 28, 551 BC  479 BC) is the name given to an extremely influential Chinese philosopher who lived in the 6th century BC. After his death, his teachings were compiled in a work known in the English-speaking world as the Analects of Confucius (Traditional: 論語; Simplified: 论语; Pinyin: Lún Yǔ, lit. "discussion over Confucius' words" — though "analects" means "a collection of excerpts from a literary work" and is thus an inaccurate translation). Confucius's enduring legacy is the codification of an ethos that predated him by centuries into a system of relatively coherent moral codes. note Indeed, he sees himself as "merely" preserving and passing on values prevalent during the Western Zhou era. In a sense, Confucianism isn't so much a philosophy (or religion, as it is sometimes erroneously called) as a model of behavior. There have been several cycles of decay and revival in the history of Confucianism, but the latest wave of Neo-Confucianism is at the core of what has been claimed as 'traditional' values in East Asia: a strong emphasis on family life and loyalties (filial piety), deference to authority and personal responsibility in authority (feudal loyalty). Associated with these are the prizing of self-discipline and (academic) learning. After his death, it was proclaimed as the official religion/ethos of the Han dynasty during the reign of Emperor Wu. (Whether they actually did it is another question entirely; a common proverb about the Han states was that they went for Legalism under the banner of Confucianism) and went on to become insanely popular. It was one out of the few hundred schools of thought to actually achieve notoriety and holds enormous sway over modern ideology and politics. note One reason for the massive influence is that Confucius advocated a path for all scholars, which is for them to become officials. As it turned out, many of Confucius's disciples did become officials, and they in turn used their influences to elevate their teacher to the status of a sage. Another reason is that Confucius's teachings are more easily followed by the upper classes, i.e. the classes who can afford to be educated and then seek their fortunes at officialdom. The Master said, "Is it not pleasant to learn with a constant perseverance and application? Is it not delightful to have friends coming from distant quarters? Is a gentleman not a man of complete virtue, who feels no discomposure though men may take no note of him?" The (supposed) descendants of Confucius have carefully maintained their family records for the past 2,500 years and are now in their 83rd generation. Tradition says that Laozi was a contemporary of his and that they met. Historical evidence seems to be that this is impossible, with Laozi either being a mythic figure or living rather later. In Western popular culture, the name of Confucius is often attached to joke proverbs expressed in mangled English, e.g. "Confucius say: He who no take candle not very bright." It hopefully goes without saying that the genuine article's thoughts were somewhat deeper; one problem with translations into European languages is that classical Chinese is a notoriously laconic and nuanced language, as if being of a completely different language group wasn't enough. In any case, "Confucius say..." or "Wise man once say..." are prefaces to facetious 'quotes'; texts that actually reference Confucius generally begin more eloquently, e.g. "The Master said..."
Agent Scully: Was vaguely agnostic, treating funeral rites and such as a means of instilling discipline and cultivating order rather than exercises in spiritualism. Blind Obedience: Warned against. It is a subordinate's duty to speak up when his superior is heading down the wrong track. "When the command is wrong, a son should resist his father, and a minister his august master." Book-Ends: According to a legend, a qilin announced Confucius's birth to his mother. Years later, another qilin was injured by a charioteer. This was considered as a prediction of Confucius's death, which happened a short time later. Crossover: His legendary meeting with Laozi, the other famous Chinese philosopher, in Luoyang. Due to the Dead: Due to the premature deaths of his son and favourite disciples, Confucius has many laments in his final years. Easy Evangelism: The Book of Filial Duty holds that by bearing the father or master's wrongdoing towards oneself stoically, and remonstrating with him when he gives wrongful orders, he will be stayed from the wrong path. Gentle Giant: According to legend, was 9 and a half feet tall, though units were shorter then, so who knows? note The Chinese feet (chi) during the Eastern Zhou era varied from 0.22m to 0.231m., which would make Confucius very tall in the modern age, and an absolute giant back in his day. As a side note, his height could have been inherited from his father, who was even taller and was said to be a great warrior, with great strength to boot. Gentleman and a Scholar: The Confucian ideal. To elaborate, for Confucius, the ideal is that one should become a gentleman first, then become an official; if he has extra energy, he should become a scholar as well. The Golden Rule: Played with. In every relationship, Confucius advocates that both parties have their responsibilities. Just as the son should be filial, so should the father be benevolent in return; just as the minister should be loyal, so should the sovereign be benevolent in return. Historical-Domain Character: Appears in Gore Vidal's Creation in the crucial third section, and since he's a favorite of Vidal's, he is shown very positively. Honor-Related Abuse: Up against an Abusive Parent or Domestic Abuse? So long as the beatings don't cause lasting harm, endure them, because that's what filial piety demands. However, as the My Master, Right or Wrong entry shows, Confucius actually advocates that both parties in a relationship (parent-child, between spouses) have their respective duties. Hot-Blooded: Not him, but his disciple Zhong You (see Manly Tears below). He supposedly predicted that due to this trope, Zhong You will not come to a good end. His father Kong He was a military officer and was said to have a quick temper. Humble Hero: Confucius himself, with his insistence that only his perseverance and love of learning set him apart from other men of learning. Impoverished Patrician: His father was a distinguished military officer, but died when Confucius was three; Confucius lived in poverty together with his mother during his childhood and adolescence. Intrepid Merchant: To Confucius' chagrin, Zigong (子贡, full name Duanmu Ci), one of his disciples. Trade is rarely considered an honourable profession by Confucians as merchants do not produce anything for themselves or others, but instead deal in the fruits of others' labours. Nevertheless, he was one of Confucius' important disciples, one who used his money and influence to protect Confucian sects in the 'age of martial philosophies'. Like Father, Like Son /Like Father, Unlike Son: Played with. Confucius was said to have inherited his father's height; unlike the old man, he did not have a quick temper, although some of his students (particularly Zilu) might agree that he had a sharp tongue. One of the provided quotes is "He did not sing on the same day in which he had been weeping." According to tradition, his disciple Zhong You (仲由; courtesy name 子路 Zilu) was killed and posthumously butchered into meat paste. After the incident, if he encountered (otherwise perfectly edible) meat paste during his meals, he would cover the paste and refuse to eat it. My Master, Right or Wrong: Applied to one's father or master, this is expected. While Blind Obedience is discouraged, the standard interpretation of filial piety is that this only extends to the duty to complain (though theoretically, this should be all that's needed). Actually disobeying is still the most heinous of sins. To be fair, Confucius advocates that just as the son and minister have their duties, so too does the father and the sovereign. The Philosopher King: Not one himself, but his philosophy was expected to be followed by any Emperor worth his salt. Given that most Chinese historians in those days were Confucian, how well they did so pretty much determined their later reputations. Renaissance Man: Confucianists are expected to enjoy music, art, and the contemplation of nature. Ret Gone: Removed from his place on the Chinese curriculum post-PRC, although he's being rehabilitated. Shout-Out: Confucius' moral philosophy was founded on the Book of Songs, from which he drew a bunch explanatory metaphors. Stay in the Kitchen: Played with. 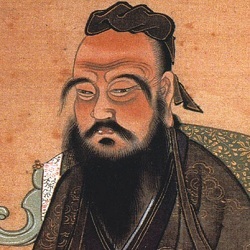 Confucius stressed that women should be obedient to the men in their lives (first their fathers, then their husbands, then their sons), but also advocated that women deserved a good, comprehensive education, and that they should not be forbidden to learn the use of weapons; he was of the opinion that knowledgeable and capable women made for a better society. Take That! : Contrary to impressions of him being a harmonious sage, Confucius actually did not mince his words in his teachings. One can easily find passages where he was scolding a student in anger, or using allegory to remind the student to reflect on himself. Thicker Than Water: Filial Piety. Serious Business back in the day. Conflicts between it and one's feudal loyalties were deadly serious business, such that suicide is one of the few acceptable solutions to such a clash. Trauma Conga Line: Confucius's final years were filled with tragedy as his only son and two disciples (Yan Hui and Zhong You) predeceased him. In particular, he himself passed away about one year after Zhong You's violent death. True Companions: The core group of disciples who studied under Confucius and compiled the Analects. "Well Done, Son!" Guy: The latest wave of Neo-Confucianism holds that a gentleman is supposed to be (somewhat) aloof from his sons— who're hoped to be paragons of achievement and filial piety, partly as a result of said aloofness and their consequent desire to please. Youngest Child Wins: Yan Zhengzai, Confucius's mother. She was the youngest of three daughters. When the 65-year old Kong He (also known as Shu Lianghe) made a marriage request to the Yan family, Zhengzai's father asked his three daughters if anyone was willing to marry Kong He. The two older sisters did not answer, but Zhengzai said she was OK. Through this marriage, she became the mother of one of the wisest men in Chinese history. note Kong He himself was said to be ten feet tall and once held open a city gate so that soldiers from his side who had already entered the city could escape, and the incident happened when Kong He was pushing 60.